1. 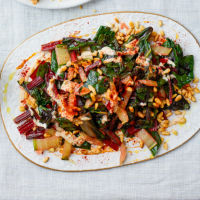 Simmer the chard stalks in a pan of water for 3-4 minutes, until tender; drain and set aside. For the sauce, whisk the tahini, crushed garlic and all but 2 tsp of the lemon juice together. Season with salt and gradually whisk in about 120ml warm water, until smooth and about the consistency of double cream. This recipe was first published in Sat Apr 01 12:44:29 BST 2017.